If you are looking to find out which are Florida’s most popular dining destinations, you should know there certainly is no shortage of incredible restaurants here. Of course, that leaves Floridians up in arms about which ones to recommend to visiting friends, or to head to themselves when the mood strikes. Can there be such a thing as too many good eats? Never! Here, we’ve compiled a list of the most popular of all the dining destinations throughout Florida. Read on to see if your favorite made the cut! 1. Bern’s Steakhouse – Tampa. This classic steakhouse has been an institution for over 60 years! They know a little something about doing steaks right. Caesar salad is prepared tableside with a made-from-scratch dressing that uses real anchovies. The wine cellar is one of the largest in the entire world too. This is a great place to go to celebrate something special. When you make reservations, be sure to also book one in their dessert room to truly spoil yourself. You won’t regret it. 2. Joe’s Stone Crab – Miami Beach. Joe’s is legendary among locals. You can’t go wrong with a place known for fresh seafood, especially Florida’s signature stone crabs. It’s been a landmark since the early 1900s, and in the restaurant industry, that’s equivalent to a million years. Be sure to polish off your meal with a slice of key lime pie for the perfect finish! Though stone crab is seasonal, this restaurant is one of the most visited within all Florida’s popular dining destinations. 3. The Old Spanish Sugar Mill – De Leon Springs. Located inside the De Leon Springs State Park, this charming place features griddles in the center of every table. Cook your own pancakes and add bananas, chocolate chips, peanut butter or anything else you like to create your own idea of the perfect pancake. Since 1961, Floridians and visitors alike have been flocking here to flip for flapjacks and enjoy a day at this beautiful state park. 4. Southport Raw Bar – Ft. Lauderdale. This hole-in-the-wall has been a staple since the 1970s. 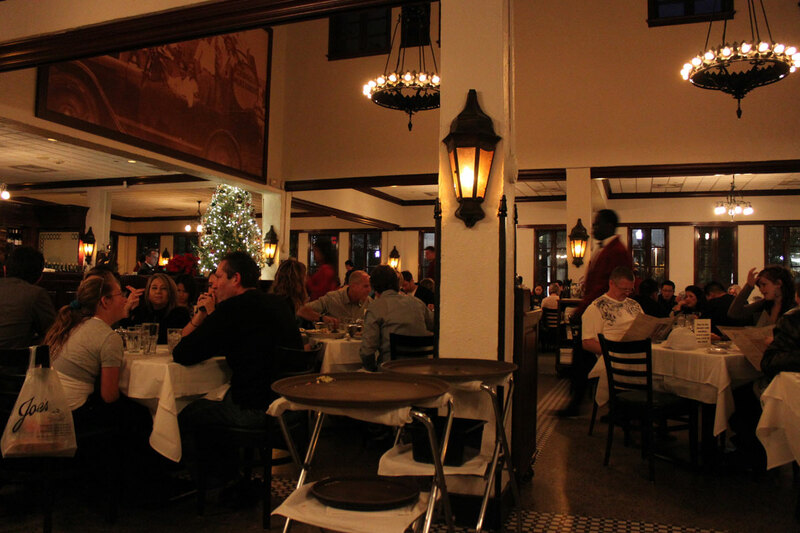 Once inside, the casual charm of old painted ceiling tiles will have you in awe until your food arrives. Old Bay shrimp are legendary here, as is the clam chowder. This is THE place for seafood lovers. Plus, you can arrive by boat and there’s nothing cooler than that! 5. Firefly – Panama City. Elegant and beautiful, this award-winning dining destination offers spectacular dishes of fresh fish from the Gulf, steaks, sushi and creative cocktails in an environment that will make you want to stay forever. The hardest part is deciding from every delectable offering. Don’t skip dessert either. 6. The Goblin Market Restaurant – Mount Dora. For a charming dining experience with a romantic atmosphere, this lovely restaurant offers gourmet indulgences like escargot, perfectly prepared Irish whiskey onion soup, and mouth-watering meats and seafood. Though Mount Dora might not be in the top listing of travel sites, this restaurant brings the county’s name to our top 6 popular dining destinations to discover in Florida.